I recently joined 1200 other participants to experience ocTEL, a professional development course for HE staff who want to make better use of technology in their teaching and learning practice. 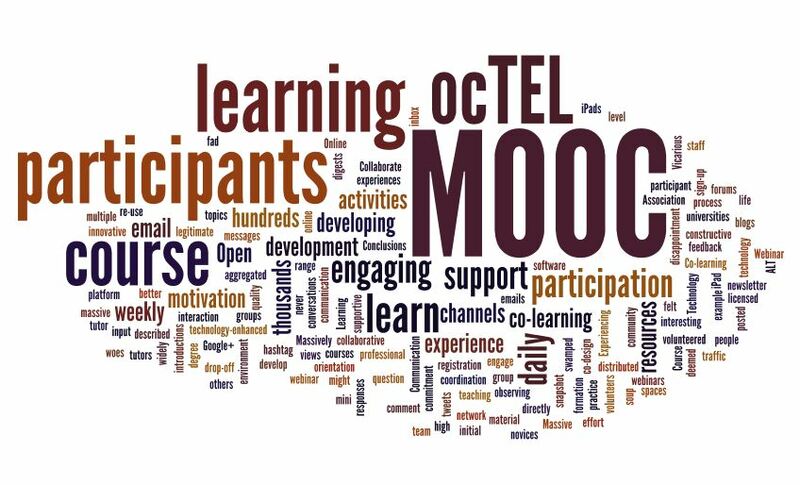 ocTEL might be described as a mini-MOOC; Massively Open Online Courses generally see initial registration in the thousands if not hundreds of thousands. The course: ocTEL was developed with funding support from the Innovation and Transformation Fund and by a widely distributed team led by the Association for Learning Technology – ALT. They only had one face-to-face meeting; design and development were primarily online collaborative activities. Over 11 weeks, ocTEL offered a range of learning activities (up to 55 hours per week) and channels for communication and interaction. The first ten days were for orientation, to allow us to get used to the various ways of engaging and to support formation of groups around specific learning topics. There were weekly webinars and lots of open educational resources forming online course materials. Tutors posed questions and facilitated course discussions. Co-learning: I was amongst the hundreds who signed up straightaway for the ocTEL Jiscmail list, only to find my inbox instantly swamped by introductions and responses to the initial question, and then by a similar volume of messages asking to be unsubscribed. Within a couple of hours, a fellow participant had advised everyone to sign-up for daily or weekly digests rather than individual email traffic to the list; an example of the co-learning that is encouraged and expected in this kind of environment, where participants learn as much from each other as from formal inputs from tutors. Many people posted messages in the early days saying they couldn’t find resources, or had forgotten which of the multiple channels to use for what. The levels of supportive comment, constructive feedback and volunteered input through the course discussions were very high and enhanced a feeling of being part of a community. Webinar woes: ocTEL hosted a weekly webinar, often featuring high-profile figures from the online learning world. I travel a lot in my work, so thought I could usefully use travel time (trains, or in my hotel room) tuning in to the recordings, if not the live sessions, on my iPad. Unfortunately, the software used for the webinars (Collaborate) does not run on iPads, and I rarely travel with a laptop these days, so this option was ruled out. And my desktop PC at work has no sound card, speakers or microphone. I could have booked a space in our videoconferencing room, but somehow the motivation was never there once I’d felt the initial disappointment. And of course the day job got in the way too. Communication soup: The course platform captured conversations from participants’ own blogs, ocTEL-hosted forums, a Google+ group set up by participants (not the hosts), tweets with the ocTEL hashtag and various other online spaces. This was the most engaging and interesting part of ocTEL for me: it was innovative in the way material was aggregated into a daily newsletter, and it really brought other participants’ views and learning experiences to life in this daily snapshot. Summary: The writing of the course and the tutor support were provided by a network of distributed volunteers and there was certainly a feeling of community developing amongst participants. ‘Vicarious participation’ – observing others’ learning rather than engaging directly with the learning activities, as I did, is deemed a legitimate form of participation and is a useful one for MOOC novices. As the course is Open, all the resources are licensed for re-use and will continue to be available (until a future iteration replaces them). The level of effort and motivation needed to engage appears to be high – and more Massive courses do see a massive drop-off in participation after initial registration. And the degree of commitment and coordination needed to develop a high quality course of this kind should not be underestimated. Many of our universities are developing MOOCs, independently or by contributing to, for example, FutureLearn or Coursera. Will they be a passing fad? Possibly, but there’s much to learn from the process of co-design and co-learning, and not only for technology-enhanced learning but other forms of collaborative, distributed professional development. There’s a lot of talk about MOOCs (Massively Open Online Courses) in HE at the moment. My institution has signed up to FutureLearn, a consortium of UK HEIs intending to offer courses from mid-2013 onwards. A lot of the ‘talk’ about MOOCs is around how game-changing they could be for the sector. Could they sound the death-knell for traditional teaching and learning? What are the implications for organisational development and change? What would ‘the student experience’ mean when students are co-learners and co-assessors and distributed potentially worldwide? Interestingly, some MOOC students are meeting up in physical locations where they find they’re co-located with other co-learners. It all seems to be a lot of hype at the moment, with no clear business models (although some are emerging) and few providing accreditation. But worthy perhaps of at least awareness amongst those of us who may have to support any resulting change in strategy, organisation and people’s practice. I hadn’t been tempted to sign up for a MOOC until the Association for Learning Technology (ALT) began the design of OcTEL, an online course in Technology Enhanced Learning. Even just typing this paragraph is giving me acronym headaches, and I suspect this MOOC may have quite a lot more. But OcTEL is one of the Innovation and Transformation Fund (ITF) projects for which I’m Programme Manager, so it seemed that if I were going to sign up for one, this ought to be it. And it’s being developed through a collaboration of volunteers which offers an interesting model and, I suspect, quite a lot of challenges, for learning design and delivery. Registration is now open, and the programme starts 4 April, with an introductory period until 14 April, for people to familiarize themselves with the MOOC way of learning and interacting. The course starts in earnest on 15 April. MOOCs lose a lot of participants during the course; to keep me on track, I thought I’d add an occasional blogpost here – if that’s ok – to share what the experience has been like. You might like to register and join me so it’s not just a one-sided view.